Best Buy needs to be more clear about their sales. I was in the market to purchase a new microphone for my podcast, and I was perusing Best Buy. They had a USB microphone with good reviews on sale for $40 off! But before I bought it, I wanted to do my proper research and check with my partners and see what we all thought. I looked at the sale label, but… huh. No end date. Well, whatever. What were the odds the sale would end over night? PRETTY DAMN GOOD, IT TURNS OUT. So I moped around Best Buy for a while with no purpose than honestly hoping everything would work out somehow. And then it did! The third or fourth employee I talked to was this super helpful older gentleman named David (shout out to David With The Gray Beard at Best Buy! ), who price-checked an even better mic for me and could get it for just $10 more than what would have been the sale price on the other mic. And that… was a pretty nice win. Now I just want to test this mic out! Writer and Artist: J. Michael Straczynski and John Romita Jr.
What a strange run Straczynski had on Amazing Spider-Man in the 2000’s. He did a lot of stuff really well—extremely well, even—like turning Aunt May into a powerful, dignified, fully-developed character, focusing on Peter and Mary Jane’s relationship and really giving them a foundation of love and faith, and introducing remarkable characters like Morlun and Ezekiel. But he also had some of the worst stories in Spider-history. Magical Spider-Totem? Spider-Man with arm spike things? Friggin’ Norman Osborn fathering Gwen Stacy’s evil children?! So what’s his legacy? It’s really a mixed bag. I liked his run as a whole, to be honest. He is a quality WRITER, even if his ideas didn’t always land, and he wrote fun, believable characters. His Peter Parker had a solid balance of dread and neurosis and melancholy with fun, quippiness, and a never-say-die attitude. And he wrote the best Aunt May that 616 Marvel has ever seen. And it all started with this story arc, which sees Peter, alone and with Mary Jane having left him, facing off against the man who would be the most powerful member of his rogues gallery, the energy vampire Morlun. Adjusting to his new life as both a bachelor and a science teacher at Midtown High, Spidey is shocked to meet an older man named Ezekiel who has powers just like his… and knows who Peter is. According to this man, Peter didn’t become Spider-Man because a spider that was irradiated bit him… he became Spider-Man because a mystical spider of destiny bit him, imbuing him with the totemic powers of a spider god. Or whatever. The radiation was incidental, you see! I mean… jeez. Come on. Ezekiel has revealed himself to Pete to warn him of the coming of Morlun and offer sanctuary in the special hiding cell he created, but Peter, falling into his obsession with responsibility, refuses, and leaves. Shortly thereafter, Morlun finds him. Marvel has gone back to the Morlun well several times since this story even though Morlun dies at the end. He came back for The Other—in which he kills Spidey, resulting in those aforementioned stupid arm spikes—and then had a whole family who hunt spiders across the Spider-Verse. But this still stands as by far the best Morlun tale. Other than “I eat animal-powered people”, he wasn’t burdened with backstory, and was just presented as an unstoppable, tireless force of nature. It’s entirely possible that the first fight Spidey and Morlun ever have has a great argument to be the greatest Spider-Man fight scene ever. Against an impossibly strong, fast, and durable foe, Spider-Man fights for hours, exhausting every trick in his arsenal. His desperate inner monologue is glorious, too, with the peak of the character recognizing a hopeless situation but refusing to quit. The two fight for an entire issue without break until the last two pages when Morlun retires to get new clothes, and Spidey finds Ezekiel and is told that he can never again hide from Morlun now that they’ve met. 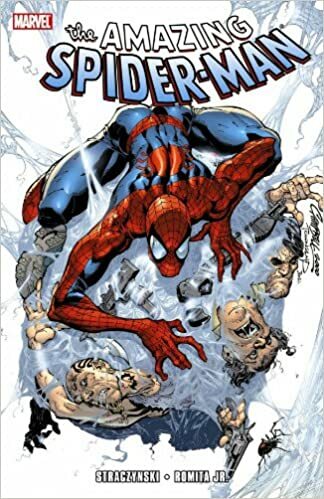 I don’t always know what I think of Straczynski’s run, but I know his Amazing Spider-Man #33 is wonderful (and, intentional or not, is as good as the original ASM #33, which is the issue that sees Spider-Man throw the giant machine off his back in an underwater lair so he can rescue Aunt May). Pete fights Morlun twice more before the encounter is won (once with Ezekiel’s help, and finally when Spidey tricks him into consuming radiation, weakening the vampire). Neither is quite as dramatic as the first bout, but they are both enjoyable, tense romps. Straczynski really shot for the fences with the battle sets in his first run. And when Spidey wins—beaten, irradiated, bloody, tired, but victorious—he returns home to collapse into sleep… and is walked in on by Aunt May, setting up the establishment of her as stronger character than we ever knew. John Romita Jr is the artist for this stretch, and he is truly an artist I can never quite figure out. When he is bad, he is truly awful. Everything is blocky, and there are lines ALL OVER THE PLACE, and details become very sloppy. But when he is on his game, he is a pretty good artist with great energy, creative visual effects that really makes things pop (what he does with Spider-Man lenses is fascinating at times), and a good sense of flow from panel to panel. He’s a bit of both here, for better or worse. I can’t rag on it, but I might have liked a different artist at the day’s end. 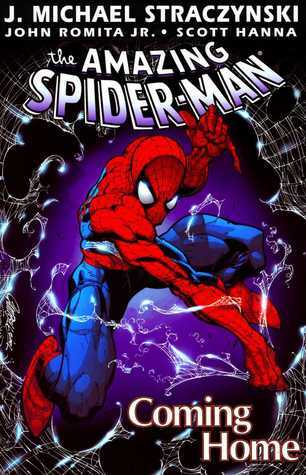 Talking Point: All this “is Straczynski good or not?” pondering made think of another Spider-writer who had ups and downs and also introduced a lot of both good and bad: Dan Slott. So if you had to have one guy write Spidey forever, who are you taking: Slott or J Michael? And while you’re thinking on that, if you want to enjoy more comic book related blogs and a weekly podcast, visit Ghosts of the Stratosphere. Our podcast is full of debates, top ten lists, and comic reviews, and we update daily! You can also follow us on Twitter, @gotstratosphere for updates! One of the better Spider-Man stories of all time, good enough to forgive the spider totem business it introduced. The fights are brutal, Ezekiel and Morlun are terrific new characters, and the idea of Peter as a teacher really works. I’m not sure Straczynski ever really matches the highs he hit here.